We heard about the apostle Peter’s miraculous escape from prison, and made paper chains to take away and a long one to tie him up with in story time. Obviously this would also be a good craft activity for Christmas. 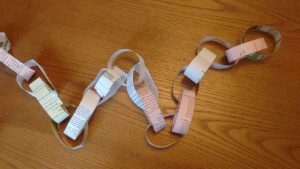 The children should glue the strips of paper to make loops, threading each one through an existing loop before glueing so that they make a chain. Of course, you don’t have to use scrap paper, but the children were quite happy with it! At Christmas you might prefer to use red, green and white or silver crepe paper for festive decorations.